That’s great! I had to look at it a couple of times myself before seeing what didn’t quite fit. Which of the FF Legend games did this come from? Legend II. The one with the illegal bananas. Less explainable than River King GBC’s Crow/Cow mixup. 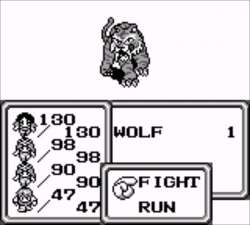 Funny enough, Monster Rancher had the exact opposite switchup: a wolf monster called “Tiger”.